The problems experienced by Tracy and her cockatoo have evoked discussion in regard to the California Cage that she has. Please be advised that it was not the intention of this site to provide any scientific evidence as to how much zinc is either safe or unsafe in powder coated cages. Additionally, if you review all the material that was presented here, at no time did we say that the cage was the cause of the zinc toxicity that the bird has experienced. We want to make that very clear. 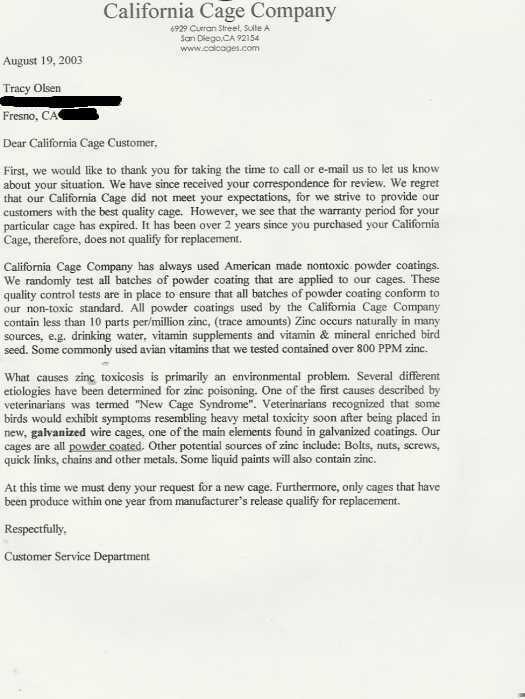 California Cages, per their own letter, states that their cages contain less than 10 ppm zinc. However, Tracy's cage was tested and the result showed 26 ppm zinc. We did not make any statements in regard to the safety of this level at all. Our only intent was to demonstrate that the testing of this cage showing a 26 ppm zinc level did not meet the specifications that the cage manufacturer claims. In light of that, we called this a manufacturing defect. Since zinc levels do not increase over time, it seems only good customer service that California Cages would replace a cage which did not meet its written standards. That, however, has been refused by the company. We did not write this page involving a question of safety but a question of customer service. We suggest you read all the facts presented, make independent inquiries and make your own decisions. After some 6 months and $2,000 spent, the owner of a cockatoo has been treataing her bird for zinc poisoning. Her bird was so seriously ill that he had even suffered seizures. The owner was working with her vet and having the bird's zinc levels tested. The owner had scrupulously removed all items other than plastic in the bird's cage. At that point, she had the powder coating tested in an analytical lab to determine the level of zinc present. 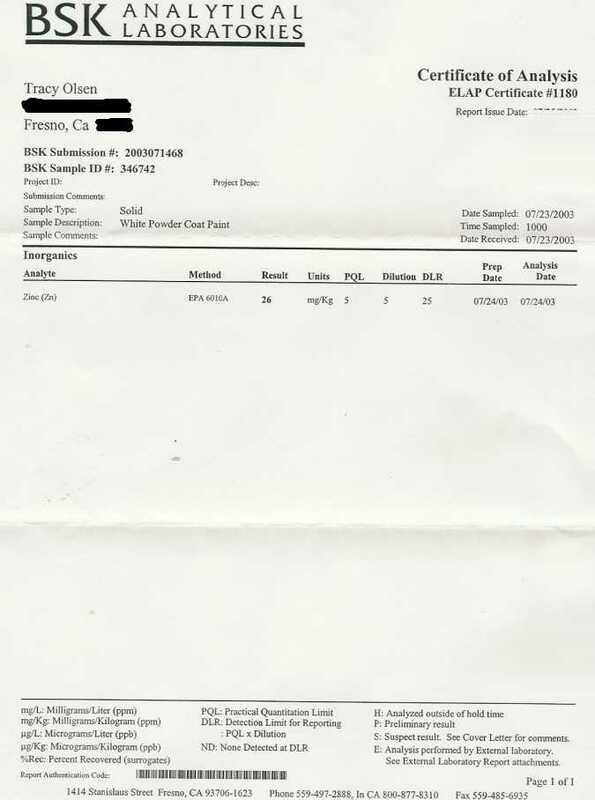 The results show that the cage contained 26 ppm while the letter from California Cage Company to this owner insisted that Cal Cages contain less than 10 ppm. Yes, even after being shown proof that this cage did not meet the specifications of the company, Cal Cages has refused to replace this cage due to its "warranty" period. Since zinc levels in power coating are not an item effected by time, we feel that putting an arbitrary time limit on the zinc levels found in powder coating is contrary to the implied warranty that the powder coating contains less than 10 ppm zinc. This is a case of defects in manufacturing which were present on the date the cage was built, however, it was not discovered by the owner until a later time. This is not a visual type of defect that can be spotted and requires lab testing. The owner did not ask Cal Cages to pay her vet bills. She simply requested a new cage meeting the company's specifications, yet she was denied. In fact, per the letter from Cal Cages, they will only replace a cage within one year of the date of manufacture - not even the purchase date! This is outrageous. We are asking you to read all of the information on this page and to email Cal Cages asking for help for Tracy Olsen in that she should be given a new cage which meets the company's written specifications. That email should be directed per Marko Gallardo to (info@calcages.com). Please pass a link to this page onto all of your bird loving friends advising them of the situation. There is much information on the internet in regard to zinc toxicity in cages and it is not the purpose of this page to repeat same. However, if you wish to test your own bird cages, we advise you to locate a local commercial analytical lab for same or perhaps a toxicology lab at a nearby University. Your avian veterinarian may be able to give you more information. After I received the email below, I called Marko immediately. He informed me that he could only speak with Tracy Olsen. I told him that she was not the owner of the website but I was so anything in regard to this page would have to be discussed with me. I asked him that since this page does not say anywhere that the cage was responsible for this bird's illness, how does a reproduction of their letter to her and the reproduction of the lab testing constitue incomplete or biased information. He was not able to give me a response, however, he advised me to list the email address as info@calcages.com instead of marko@calcages.com since the former "reached more people" and the latter is his personal email address. Be advised that his personal email address is shown on the calcages.com site. I do not wish to get into details about Mrs. Olsen's situation, but any questions and comments you might have, you are more than welcome to give us a call. I feel that the information on your web site is incomplete and completely biased. And I will make sure to seek legal council from our attorney on laws that prohibit such slander and misuse of information. I am outraged that Cal Cages has refused to replace Tracy Olsen's Cal Cage which was tested and proven to contain more parts per million of zinc than Cal Cages specifies. Zinc levels in powder coating are not something that is effected by time and this was clearly a manufacturing defect. I have seen the lab testing report on her cage and your letter denying her claim. As the number one manufacturer of bird cages in the United States as you purport on your web page, I would expect that you would stand behind your product. Your failure to remedy this situation is showing a disregard for your manufacturing standards. We have placed this information on our web pages and are sure you will be hearing from many others in this regard. Addendum #2 - Tracy is an "isolated incident?" Then why the refusal to replace this cage to at least promote customer satisfaction and stand behind their product? It seems Tracy's cage not meeting their specifications is of no concern. This is a FORM letter that is being sent out to those who are writing them! Think on that one!!! I would like to take this opportunity to assure you that California Cage Company has always used American made nontoxic powder coatings. We randomly test our cages to sure us and you of that fact. If you would like, we can send you technical data and safety sheets that our powder coat provider has, explaining the contents of the powder we use. Mrs. Olsen's situation is unfortunate, but her cage is more than 2 1/2 years old, which makes it an isolated incident. Furthermore, we have never had a claim regarding our powder coat being dangerous for our bird companion, and we've been in business for close to 20 years. I invite to you to reply or call if you have any further questions. Attached is a letter in response to the rumors that have been circulating through the internet. Also, a link to research that has been done on the subject. We have not ignored the situation but instead have tried to gather the proper information to insist that our product is safe for birds. I would appreciate you taking the time to read both letter and essays on the matter, and hope you will forward this information on and post it on your internet site. I would be more than happy to answer any further questions you might have and we'll do what we can to restore your faith in our company. Thank you. Zinc & Parrots: More than you ever wanted to know! Cocka2.Com has removed Tracy's address for confidentiality.